These before-and-after images are available online at http://mars.jpl.nasa.gov/mro/multimedia/images/?ImageID=6087 . 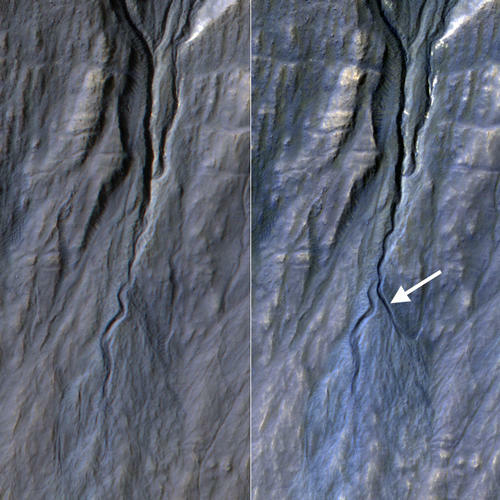 This pair of before (left) and after (right) images from the High Resolution Imaging Science Experiment (HiRISE) camera on NASA’s Mars Reconnaissance Orbiter documents formation of a new channel on a Martian slope between 2010 and 2013, likely resulting from activity of carbon-dioxide frost. Image Credit: NASA/JPL-Caltech/Univ. of Arizona.